Research into the composition of natural hydrocolloids has opened great opportunities with the discovery of special properties of the plant Guarkernmehl (Guar Gum). Did You Know, Natural Thickeners Have Great Health Benefits? The discovery of the nutritional health benefits of the Guarkernmehl has caused deeper interest among nutritionists on this product. Apart from its thickening properties, research has shown that it has high soluble fiber content, which is critical in reducing the absorption of cholesterol in the small intestines. Research has also shown that consuming 5 grams of the product daily can reduce the blood glucose levels by up to 17%, which is a very important observation in the management of diabetes. Partial hydrolyzation of Guarkernmehl reduces its thickening properties. This reduced form is used to manage incidences of diarrhea in hospital patients. The world is quickly moving from the mineral and synthetic foods to the organic or natural foods. In the Americas alone, market analysts reported a 14% growth in the organic foods sector and greater growth is expected. 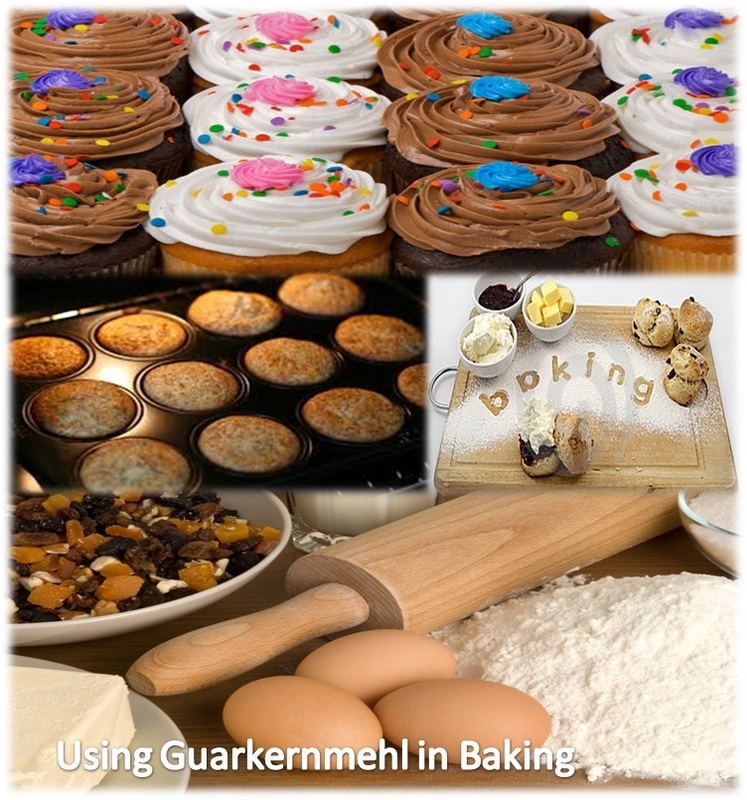 Guarkernmehl is widely accepted as an organic food ingredient globally. For food ingredients, it is used in its purest form. In the processing of Guarkernmehl, the quality of product is actually determined by the purification level. The form used in food processing has a viscosity of 2500- 6500 cps and the particle size must go through the 100 to 400 mesh. 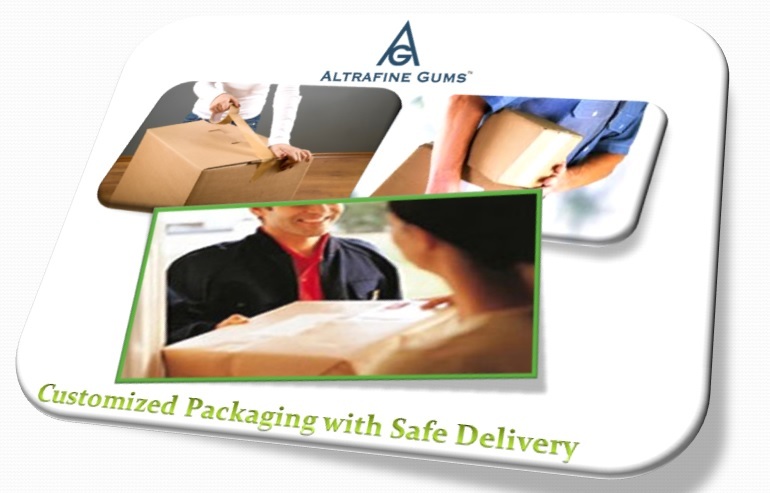 This pure form is available from few outlets such as “www.altrafine.com” which has specialized in production of food grade gums. One of the most common problems occurring during backing is the release of water held in the dough during preparation, reducing the yield of the dough. Guarkernmehl is used to prevent this as well as keep the dough dry. It reduces uneven cracking and crumbling of biscuits. In breads, it enhances moisture holding of the dough as well improving the cellular structure. Enhance stability and smoothness of dough. Eliminates cracking, stickiness, and enhances moisture retention in flour and corn products. Cheese made from cream is also susceptible to the problem of water release from the chemical structure. Guarkernmehl is used in binding the moisture and improving the overall texture of the cheese. According to research, Guarkernmehl is a great and vital natural health food ingredient and has been classified as a functional food ingredient. The world is moving towards organic foods and this has caused increased interest in the Guarkernmehl due to its natural ingredients and its impact on our health. It is used in health plans as a way of managing the blood sugar as well as reducing the uptake of cholesterol from the small intestines. The food industry consumes highest quality guar gum which is by a measure of viscosity. It is also used in the baking process to reduce syneresis and improve texture of dough. “Eat more fiber” is the common slogan among health workers and nutritionists today. Dietary fiber has amazing benefits to the body and practitioners recommend daily intake. Insoluble fiber represents indigestible nutrients and has more water holding capacity. Their importance nutritionally is helping increase the bulk of the waste thus easier movement of the foods through the colons. People with problems of watery stool therefore benefit immensely from this form of fiber. Soluble fiber undergoes a partial fermentation process in the digestive system and is broken down by bacteria in the system releasing fatty acids such as propionate and acetate, which have tremendous health benefits. Research into the nutritional composition of the fenugreek seed shows that they have 20 – 25 % proteins, over 45% dietary fiber,20-25% soluble fiber, and 6-8% essential oils. These high levels of fiber make fenugreek a great source of dietary fiber, which must be utilized. The herb fenugreek is in the family leguminosae, and the molecular composition of the seed is a distinguishing characteristic of the various hydrocolloids. The chemical structure consists of a mannan backbone with galactose side units attached to the structure by glycosidic bonds. The ratio of these mannan units to galactose is also a differentiating criterion among the different species. Unlike the others, fenugreek has a 1:1 ratio of mannans to galactose. Due to this factor, the units are more evenly distributed in the structure, making it easier for hydration and more solubility. It also causes reduced viscosity in fenugreek as compared to others in the group. The molecules also easily disintegrate in solution without any special temperature requirements. This makes fenugreek a great food ingredient over other natural hydrocolloids. 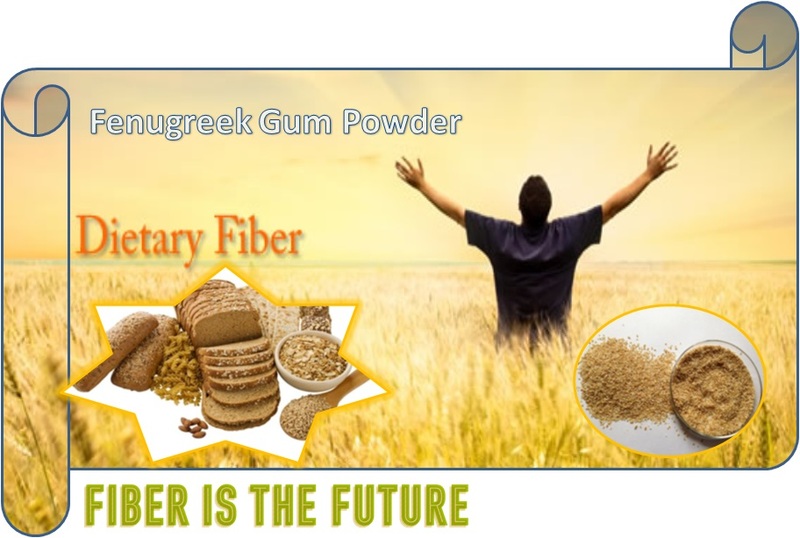 Constipation and unstable digestive system resulting from fiber deficiency is corrected by incorporating fenugreek gum powder in our diet. Obesity; Research has shown that a high fiber and protein rich food enhances secretion on anorexigenic and insulin synthesizing hormones which enhance the bodies tolerance to glucose as well as reduce accumulation of fat in the body. Diabetes mellitus; According to a research done,100 gms with 50% dietary fiber of fenugreek consumed in 10 days showed a whopping 25% decrease in the level of glucose in the blood. Other conditions managed using this product include cholesterol levels, hypertension and some lung problems. Nutritional researchers recommend a daily intake of at least 38 grams men and 25 g women adults 50 years and below. Over 50 years of age persons require lesser quantity of 30 grams men and 21 grams women. Supplements comprising of fenugreek powder tablets or capsules combined with other nutrients are available for faster replenishment of body fiber. With the knowledge of the dietary fiber in this gum, it has gained widespread acceptance as a food ingredient in milk products and nutritional drinks. It is also a great thickening and gelling agent. Renowned chefs in the world use these hydrocolloids to create gluten free recipes, salad dressings, soup thickeners, in producing baked goods & breads, gravies, sauces & dips as a suspension and stabilize emulsions and even in making of whipped ice cream. Fenugreek gum powder, which is also known as “Bockshornklee, Griechisches Heu” in German is available in the most pure form at “www.altrafine.com” is a great source of dietary fiber for our diets. The soluble fiber in the powder improves the digestive system and is critical in the regulation of the glucose levels in the blood. Body conditions addressed by this powder include constipation, diabetes, colon cancer and even some lung conditions. It is an important ingredient as a thickener, stabilizer and emulsifier in foods. While investing in bulk orders there is lot of things which the buyer needs to consider about. Starting from quality to quantity required, supply chain, etc. When it comes to buying food ingredients that are not possibly available in locality thinking of buying the ingredient where it is grown and processed will be the right decision. Altrafine, a leading food ingredient processor and supplier in India provides the opportunity for domestic and international buyers to buy in bulk quantity of products like guar gum powder, cassia tora seeds, meal, splits and gum powder, sesbania gum powder, kappa carrageenan and many more processed products. We supply food grade cassia tora seeds to international destinations in bulk quantity. How do we process our supply? We buy the raw material directly from farmers who maintain perfect soil condition for cultivating the respective plants. With the help of advanced equipments and stick to Sanitary Standard Operation Procedures and proceed with packaging as per the client requirement. We process the raw materials be sending to different processing departments like cleaning, processing, grade determining, obtaining finished products (as required by the consumer in powder or split or meal form or seeds) and then proceed with storage and packaging. Our professionals keep up with constant testing during every processing stage. This procedure is followed for all products. We supply food grade cassia tora seed for animal feed which are in cleaned condition and ready to be applied for further processing. 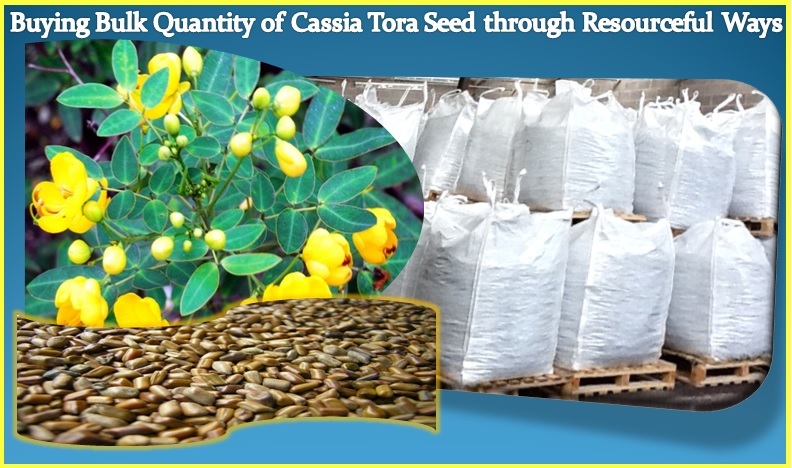 Our cassia tora seed products are food grade and applied for animal feed in majority. No repeated shipping charges like in the case of buying minimal quantity repeatedly. Buying more than the determined quantity amounts to support additional production in a cost effective way. Buying from the same supplier is yet resourceful way to obtain good quality of product throughout. Bulk suppliers who are in the process of exporting or supplying to different nations will take care of timely delivery of products to the respective destinations and also take care of the transit procedures in a safe way. One of the important advantages of buying higher quantity from suppliers like Altrafine is that the buyer can stay assured about constant quality and quantity. Altrafine also focus on maintaining the grade of food ingredients like cassia tora gum powder, cassia tora meal, cassia tora splits, etc. We understand the requirements of different consumers and stick to the respective grade they need. On the other hand, the consumers explain the nature of their products we suggest them the suitable grade. We accept customized packaging requirements of the consumers and strictly adhere to suitable packaging process that supports for safe delivery of goods. Buying food ingredients or food ingredient raw materials like cassia tora seeds in bulk would be safe when approached to a bulk supplier. There are several financial as well as application oriented benefits while making bulk orders especially for international consumers. Cassia tora is a plant that belongs to the Caesulpinaceae family. The seeds of this plant are brown in color and it contains good nutrient value. The seeds of this plant are found to be very useful for which they are processed and obtained in different forms for different applications. Apart from that, the seeds are highly influential in nature as they contain excellent medicinal properties and applied to treat skin diseases, flatulence, cardiac disorders, etc. Cassia Tora Splits-The endosperm of cassia tora seed is called as split. It is an important ingredient that is separated from the seeds to process further to obtain gum powder. The splits of cassia tora contain polysaccharides that supports in the extraction of gum powder. Cassia Tora Gum Powder-Cassia tora gum powder contains good viscous capacity that can be obtained only after heating the gum to get dissolved completely in water. It is widely applied as gelling, thickening, emulsifying or stabilizing agent. Cassia Tora Meal –This by product contains a blend of crude fibre, crude protein, silica, fat and moisture content which make it suitable for animal feed application. It is regarded for its good binding property and stays effecting for obtaining nutritious animal feed. 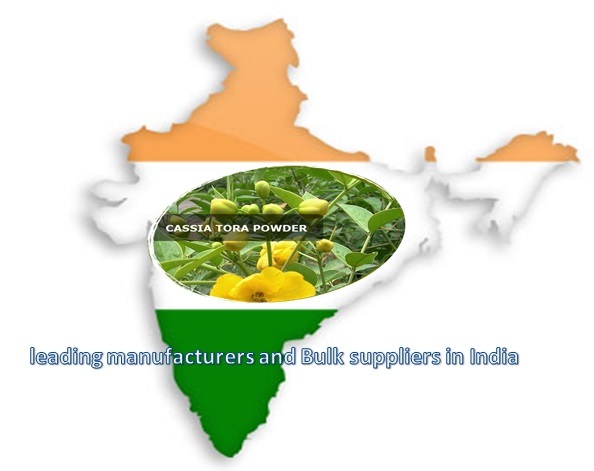 How about buying from Bulk Supplier in India? Since we can get raw materials from our own country we are able to find the best quality seeds which we process and bring out in desired form. Buying naturally available ingredient is a great way of saving money. With the best and latest research and development facilities we are able to supply good quality and reliable cassia tora extracts in bulk. 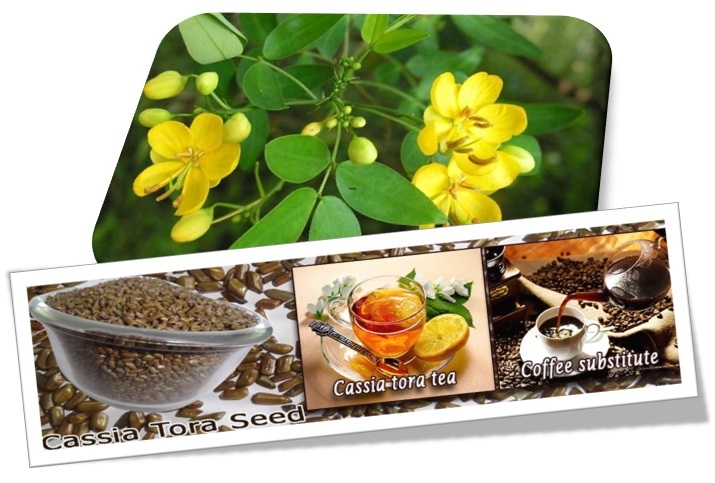 Cassia tora seeds are processed to obtain different forms of products including splits, meal and gum powder. These are applicable for variety of industrial processes. It is highly irrigated in northern parts of India and buying in bulk quantity from Indian supplier is a profitable option.